Dr. Richard L. Pimental-Habib, Ph.D.,C.C.H. PRAISE for EMPOWERING THE TRIBE ~ A Positive Guide to Gay and Lesbian Self-Esteem from Dr. Laurence C. Keene, Ph.D.; Michael Kearns; and Dr. Juliann Kerrigan, Ed.D. 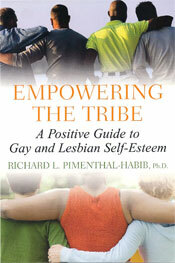 SYNOPSIS of EMPOWERING THE TRIBE ~ A Positive Guide to Gay and Lesbian Self-Esteem. EXCERPTS from EMPOWERING THE TRIBE ~ A Positive Guide to Gay and Lesbian Self-Esteem. Do you want the courage to truly love the one you're with? Are you bouncing aimlessly from partner to partner? Would you like to enrich all of your relationships, including those with your friends and family? With thought-provoking guidance and soul searching wisdom, THE POWER OF A PARTNER provides gay men and lesbians with a blueprint for forming and cultivating meaningful and long-lasting relationships of all kinds. Whether you want to learn how to relate better to lovers or family members, coworkers or friends, the warm, sometimes humorous, and always enlightening guidance found in THE POWER OF A PARTNER will help you secure the greatest emotional, physical, and spiritual satisfaction possible. PRAISE for THE POWER OF A PARTNER ~ Creating and Maintaining Healthy Gay and Lesbian Relationships from Dr. Kenneth D. George, author of Mr. Right Is Out There. SYNOPSIS of THE POWER OF A PARTNER ~ Creating and Maintaining Healthy Gay and Lesbian Relationships. 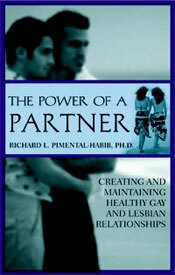 EXCERPTS from THE POWER OF A PARTNER ~ A Positive Guide to Gay and Lesbian Self-Esteem. The Violets In the Mountains, a booklet of inspirational quotes, categorized by topic: Love, Possibilities, Creation, Acceptance, Self, Life and Death. Comforting, humorous, and inspirational, these quotes can really help you make it through the day! Send e-mail with your address and phone number, and allow 2 - 4 weeks for shipping. Copyright © 1999-2019 Dr. Richard L. Pimental-Habib, Ph.D., C.C.H.